Download "Rule 4 Criminal Practice"
1 Page 1 Rule 4 Criminal Practice 4.01 Initial appearance in criminal arraignment session. Upon release of the defendant from the pretrial confinement, or upon the issuance of a summons, the clerk shall assign an arraignment date. At arraignment the defendant, or counsel, may enter one of the following pleas: (1) not guilty, and request a record trial; (2) not guilty, and request a jury trial (with the exception of minor misdemeanors); (3) no contest; or (4) guilty. If a not guilty plea is entered the defendant, or counsel, will be asked if the speedy trial provisions will be waived or not waived. Prior to arraignment counsel for any defendant who has been notified by a summons may appear in the clerk's office, second floor, 375 South High Street, and complete the appropriate plea form. 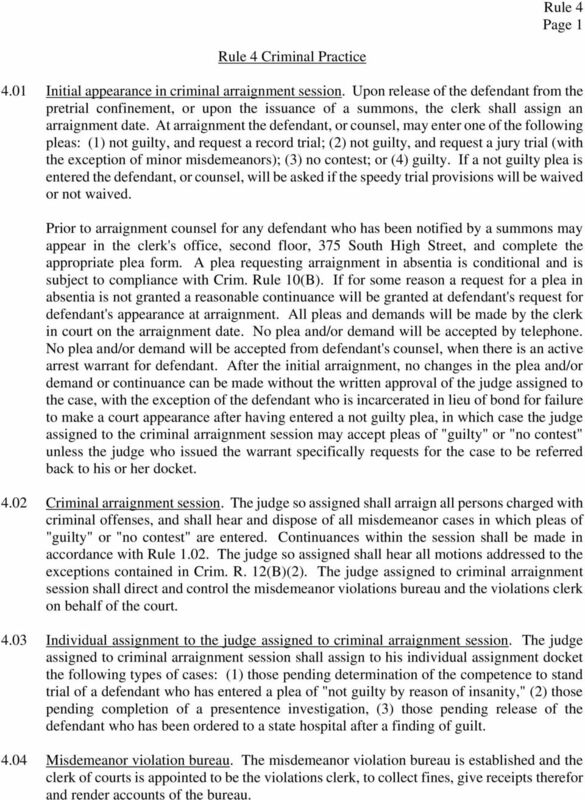 A plea requesting arraignment in absentia is conditional and is subject to compliance with Crim. Rule 10(B). If for some reason a request for a plea in absentia is not granted a reasonable continuance will be granted at defendant's request for defendant's appearance at arraignment. All pleas and demands will be made by the clerk in court on the arraignment date. No plea and/or demand will be accepted by telephone. 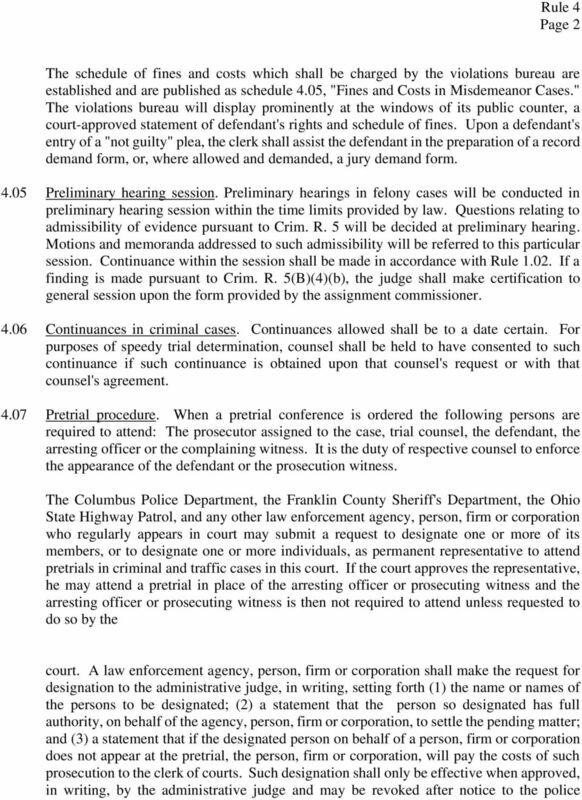 No plea and/or demand will be accepted from defendant's counsel, when there is an active arrest warrant for defendant. After the initial arraignment, no changes in the plea and/or demand or continuance can be made without the written approval of the judge assigned to the case, with the exception of the defendant who is incarcerated in lieu of bond for failure to make a court appearance after having entered a not guilty plea, in which case the judge assigned to the criminal arraignment session may accept pleas of "guilty" or "no contest" unless the judge who issued the warrant specifically requests for the case to be referred back to his or her docket Criminal arraignment session. The judge so assigned shall arraign all persons charged with criminal offenses, and shall hear and dispose of all misdemeanor cases in which pleas of "guilty" or "no contest" are entered. Continuances within the session shall be made in accordance with Rule The judge so assigned shall hear all motions addressed to the exceptions contained in Crim. R. 12(B)(2). The judge assigned to criminal arraignment session shall direct and control the misdemeanor violations bureau and the violations clerk on behalf of the court Individual assignment to the judge assigned to criminal arraignment session. The judge assigned to criminal arraignment session shall assign to his individual assignment docket the following types of cases: (1) those pending determination of the competence to stand trial of a defendant who has entered a plea of "not guilty by reason of insanity," (2) those pending completion of a presentence investigation, (3) those pending release of the defendant who has been ordered to a state hospital after a finding of guilt Misdemeanor violation bureau. The misdemeanor violation bureau is established and the clerk of courts is appointed to be the violations clerk, to collect fines, give receipts therefor and render accounts of the bureau. 5 Page 5 Crim. R. 46(F). 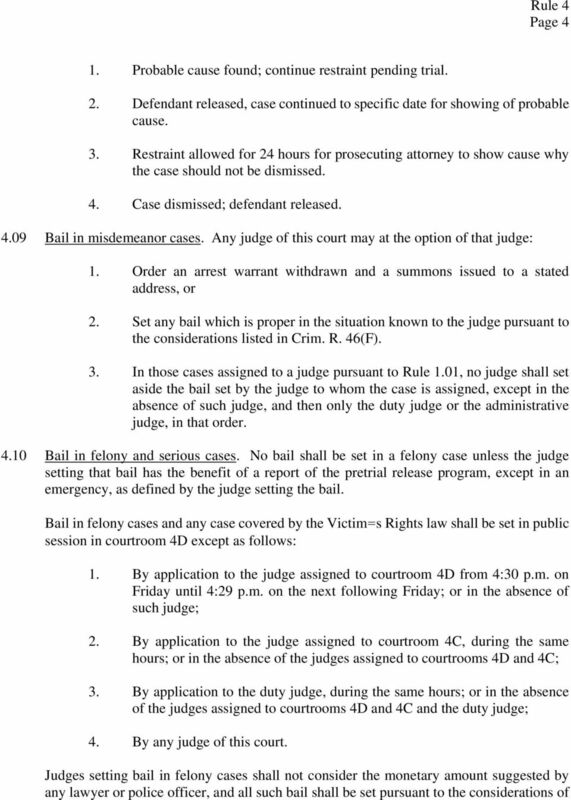 Bail shall be set in protection order cases, pursuant to the considerations of R.C (A) and R.C Defendant=s option of paying fine, fees and costs in certain misdemeanor cases or being slated. 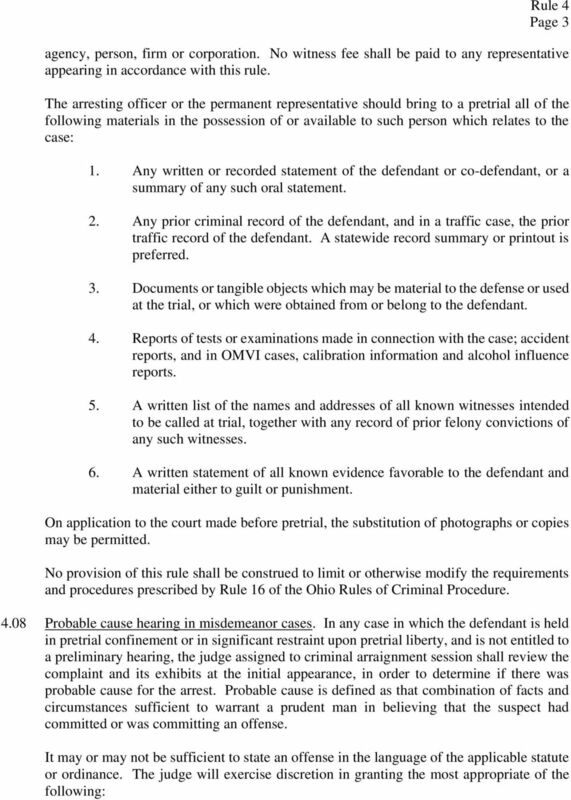 Any person arrested (ordered-in) for failure to appear at a designated time for arraignment, trial or enforcement of sentence on a minor misdemeanor for which the fine, fees and costs are prescribed in a published schedule adopted by this court, has the option of either immediately and voluntarily paying such fine and any fees and costs which have accrued in the case, or of being slated. The person shall be advised of this option by the arresting officer at the time of arrest. If the person elects to make such payment he shall be escorted by the arresting officer to the office of the clerk of courts and, on making such payment, he shall be released from custody. 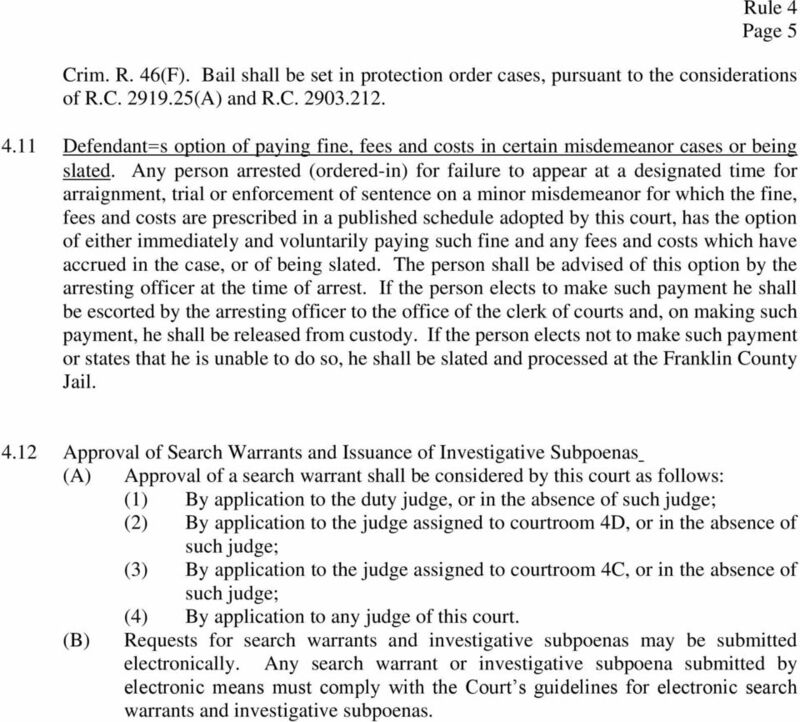 If the person elects not to make such payment or states that he is unable to do so, he shall be slated and processed at the Franklin County Jail Approval of Search Warrants and Issuance of Investigative Subpoenas (A) Approval of a search warrant shall be considered by this court as follows: (1) By application to the duty judge, or in the absence of (2) By application to the judge assigned to courtroom 4D, or in the absence of (3) By application to the judge assigned to courtroom 4C, or in the absence of (4) By application to any judge of this court. (B) Requests for search warrants and investigative subpoenas may be submitted electronically. Any search warrant or investigative subpoena submitted by electronic means must comply with the Court s guidelines for electronic search warrants and investigative subpoenas. You also have the right to ask questions of witnesses who testify against you. This is the right to cross examine. SUPERIOR COURT RULES OF CRIMINAL PROCEDURE. Rule 1. Scope; Criminal Division Branches; Tax Division; Sections. RULE 510. CONTENTS OF SUMMONS; NOTICE OF PRELIMINARY HEARING. UTAH RULES OF CRIMINAL PROCEDURE. (a) This chapter shall be known and may be cited as the "Utah Rules of Criminal Procedure."